Simultaneous reverse and normal initiation technique for atom transfer radical copolymerization (SR&NI ATRP) of styrene and methyl methacrylate in the presence of hexamethyldisilazane (HMDS)-modified silica aerogel nanoparticles (H-SAN) and investigating the effect of addition of H-SAN on the copolymerization and thermal properties of the products are discussed. Some unique features of the H-SAN are evaluated using nitrogen adsorption/desorption isotherm, SEM and TEM. Conversion and molecular weight determinations were carried out using GC and SEC respectively. Adding of H-SAN by 3 wt% results in decrement of conversion from 94 to 73%. 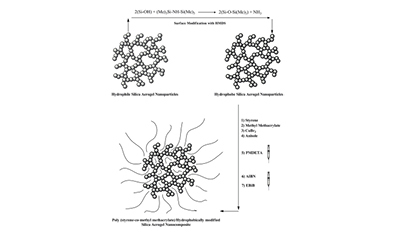 In addition, molecular weight of copolymer chains decreases from 19500 to 16000 g.mol-1. However, polydispersity index values increases from 1.29 to 1.65. Linear increase of ln(M0/M) with time for all the samples shows that copolymerization proceeds in a living manner. Increasing thermal stability of the nanocomposites is demonstrated by TGA. DSC results show a decrease in glass transition temperature from 70.3 to 63.5 °C by addition of 3 wt% H-SAN.